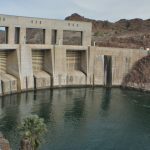 Post 80: Parker Dam & Lake Havasu City, AZ - A Snails Life and Lovin' it! Speaking to various people in Quartzsite AZ, we heard about this beautiful city called Lake Havasu City. 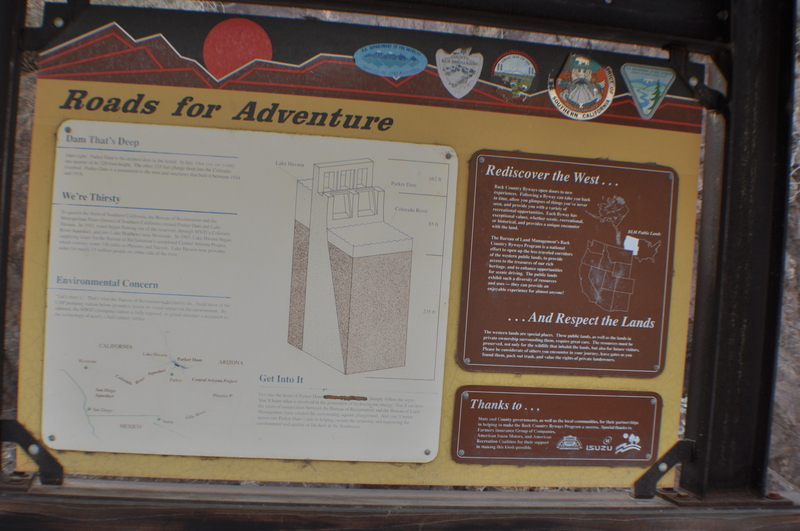 It was suggested to us a few times it was a “MUST SEE” area to visit. With that encouragement, how could you NOT go on a “Road Trip”? lol. On a bright sunny day, we decided this was the perfect day. The 2 hour trip to Lake Havasu City began. 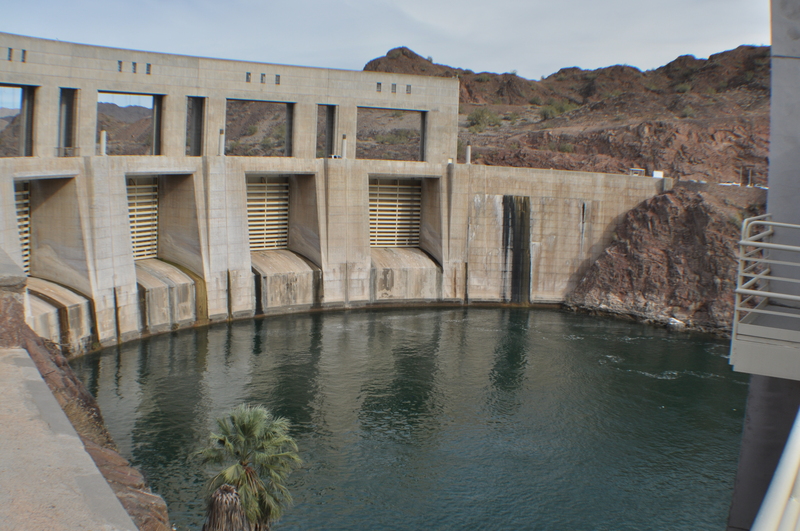 Along the way, we were also told to stop and visit the Parker Dam just North of Parker AZ. 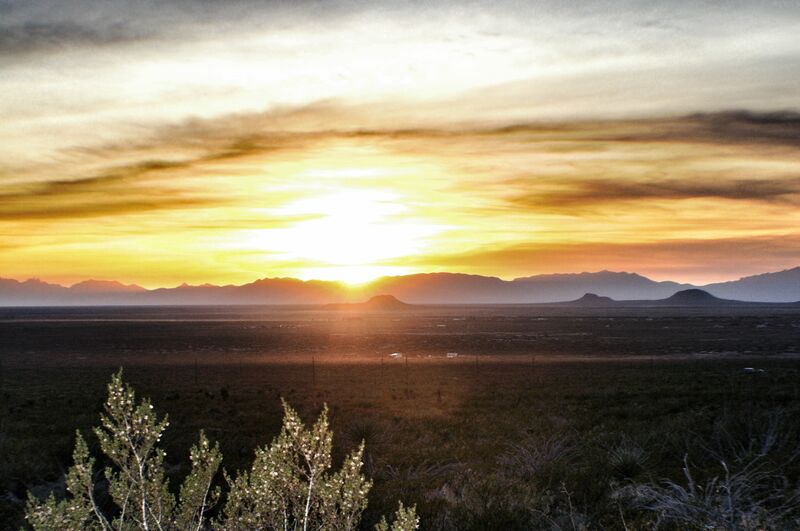 Any road trip we have taken since arriving in Quartzsite has always been pleasant. 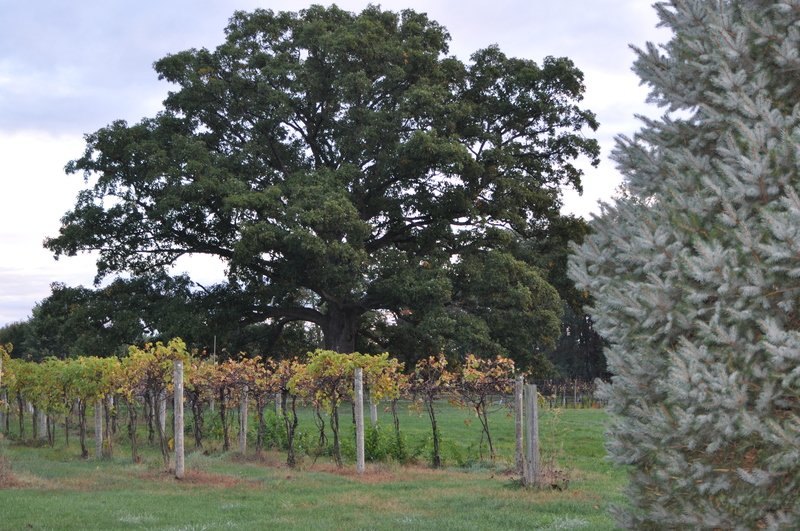 It has not rained since before we arrived in late November. Some days are cooler than others. But the sun is usually out and the weather is always dry. As we drove along we were familiar with this part of the road. We had been to Parker a few times already to do our food shopping. We were looking forward to reaching new unexplored territories :). Parker Dam is situated just North of Parker City. We had only seen the signs directing us to the location, never the dam itself. To our surprise we found ourselves on a narrow 2 lane highway winding around a cliff with a drop off on one side allowing for the Colorado River to flow past. If we had not been looking for the dam, we would not have noticed the side road leading to the location. 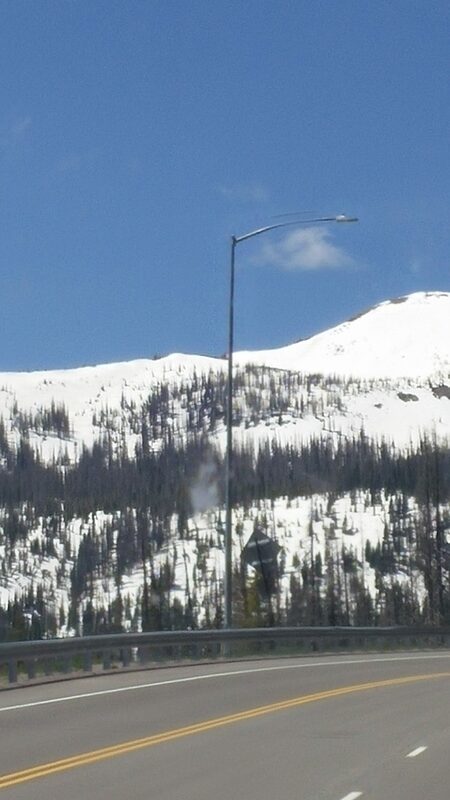 Once we made the left hand turn the road became even more narrow but as we looked up, we saw the dam. Cooool, it curved slightly and wasn’t overly wide, as it crossed over the Colorado River but the architecture was really impressive. Parker Dam is a concrete arch-gravity dam. Parker Dam is 155 miles down stream of Hoover Dam. “ Built between 1934 and 1938 by the Bureau of Reclamation, it is 320 feet (98 m) high, 235 feet (72 m) of which are below the riverbed, making it the deepest dam in the world.” (Borrowed from Wikipedia). 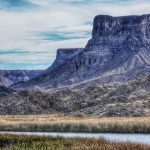 This is the part that I found the most interesting, Parker Dam straddles the state border at the most narrowest point that the rivers passes between the Whipple Mountains, California and Buckskin Mountains of Arizona. As we went to drive over the dam (come on you KNEW we just had to do that haha) we passed by a friendly guard who waved to us. He was sitting in a small booth at the beginning of the dam. On the other side his partner was sitting in a matching booth. By the way, no RVs, trailers or commercial trucks are allowed to drive over the dam. The road way is very narrow. We were able to park on the other side and get out of the Truck to cross the road to take pictures. Just looking over the edge of the cement railing was enough to put butterflies in Joy’s tummy. BUT, looking straight out was well worth the visit. The street lights on the dam were very pretty and took an ordinary useful dam turning it into a pleasing architectural vision. 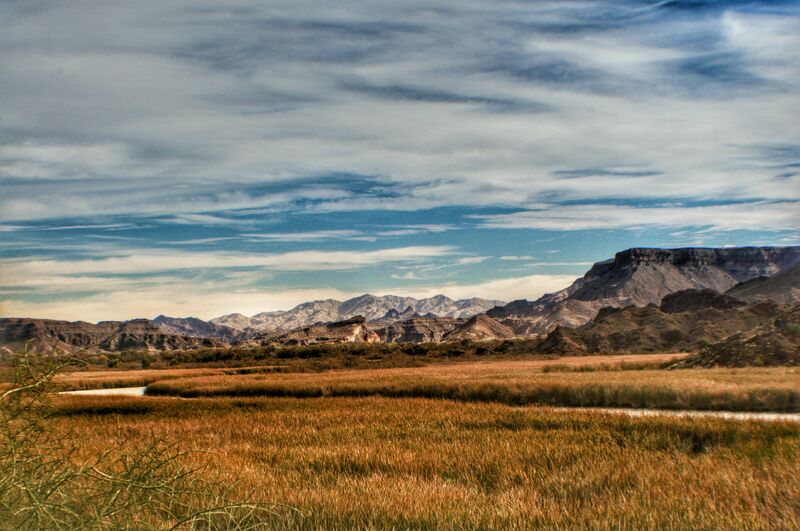 Continuing on to Lake Havasu City, the sights became even more delightful. We past by a GREEN Golf Course with Palm trees on the course and golfers. Joy immediately had to text her brother back in Ontario, Cda who is an avid golfer to share this amazing site. For some reason, he didn’t appreciate the news. (Could be he was getting hit by a major snowstorm at the time haha) Oops Sorry Bro. Moving along down the road, we saw beautiful blue water peeking in and out of the mountains and trailer parks every so often. We kept thinking, how wonderful it would be to move down here to camp for the winter. 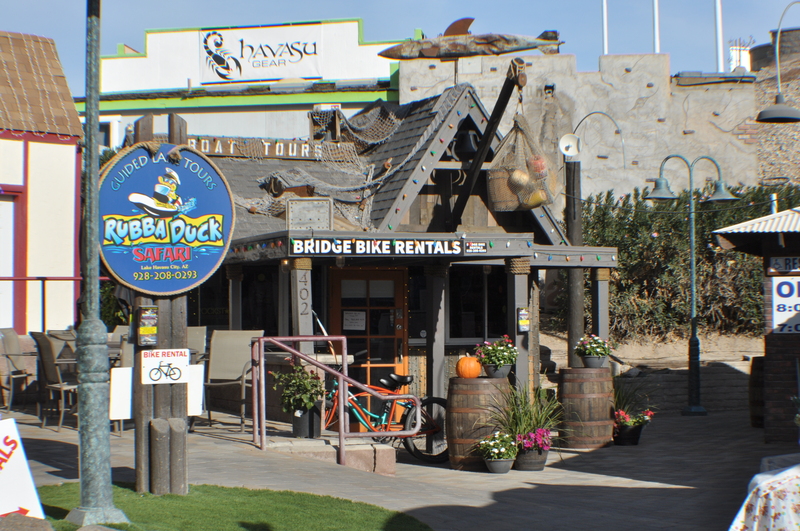 Eventually we came into Lake Havasu City. THAT’S when the water opened up sparkling blue and an immense city spread out before us. As we drove through, we noticed it seemed very clean with a strong Spanish influence in many of the homes and store fronts. Several homes were enormous and quite impressive. Multi level, glass walls or a strong Spanish flourish surrounding the whole property. Palm trees everywhere. High end stores everywhere and huge open air malls with plenty of parking. The streets were 4 lanes wide and everything was spotless. 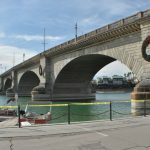 Bill had read of a “London Bridge ” here in Lake Havasu City that he wanted to show Joy, so the search was on to find this oddity in an American city lol. 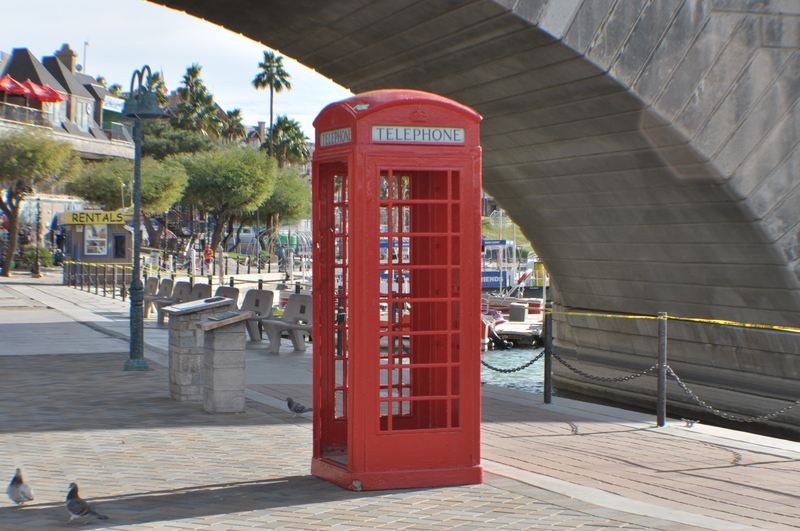 Oddly enough the signs began to appear and the London Bridge in Lake Havasu City was quite easy to find. We made the left hand turn at the lights and parked. Bill had done the research on the bridge and was giving Joy the history lesson as we walked through this very British looking area. There were many stores selling UK items, an information center and a few restaurants that offered very English pub food :). If we hadn’t just had lunch, Joy would have loved to have had some English fish and chips. 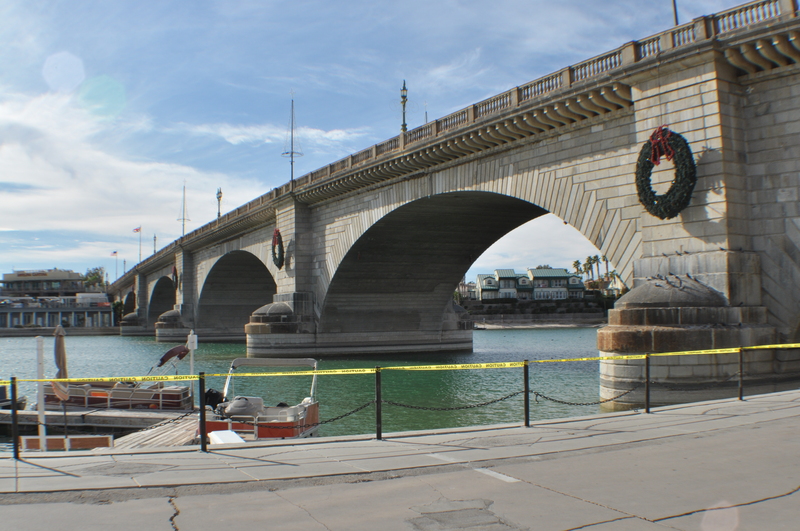 The London Bridge traveled 5,400 miles from London, England to arrive in Lake Havasu, Az. This was not the original bridge that had spanned the Thames River in London, England, there were a few others before this one. This particular bridge was designed in 1799 by a Scottish engineer John Rennie. The new London bridge was completed in 1831. As time passed, this new bridge (in London) began to sink at the rate of an inch every 8 years. By 1924, the east side of the bridge was 3 to 4 inches lower than the west side of the bridge. The bridge was not designed to tolerate 20th century traffic. In 1967, the Common Council of London, wanted to sell the bridge. 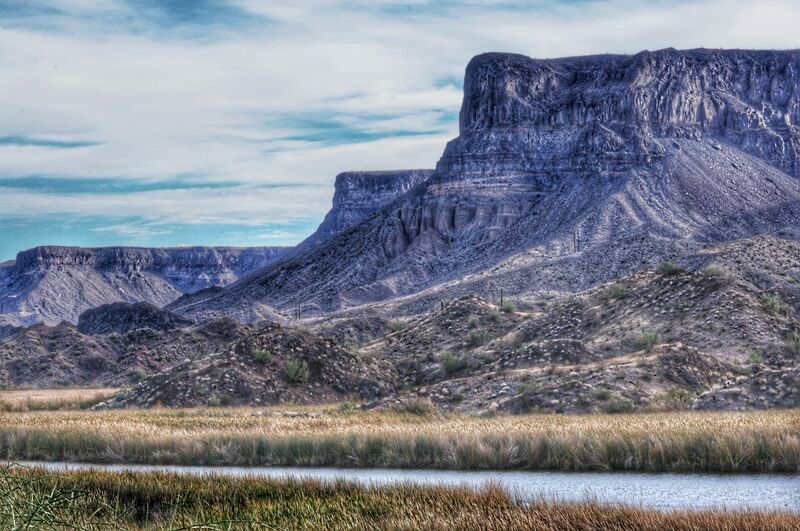 Lake Havasu City Founder and entrepreneur Robert P. McCulloch placed the winning bid of ~$2,460,000 on April 18, 1968. Standing beside the bridge and water, looking around this acre of “England” we were really glad we had made the effort to explore the London Bridge and Lake Havasu City. We plan to go back again because the whole experience is so enjoyable. POST 16: Meandering our way to California!